East of Albufeira. Falesia. Stunning, long stretch of beach. 3 bedroom villa with private pool with a superb Albufeira location. Close to Guia, Albufeira Beaches & Albufeira Old Town. 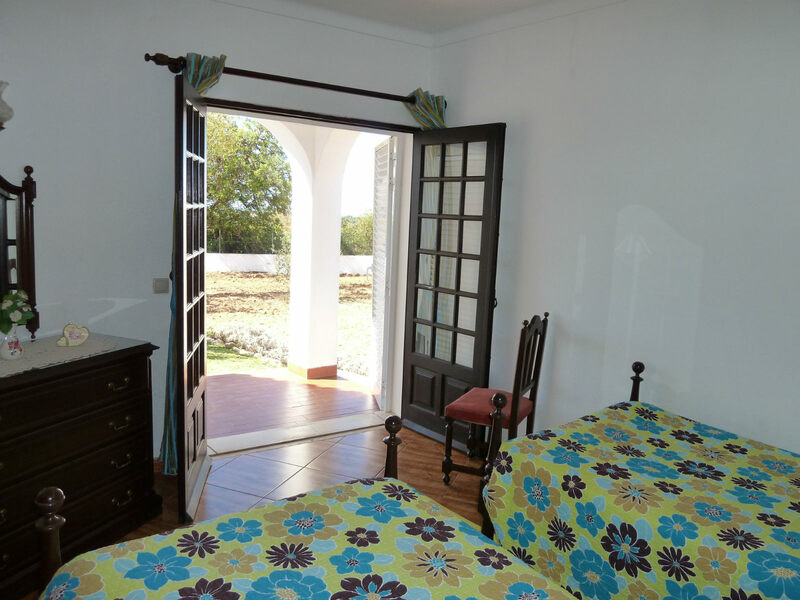 3 Bedrooms, 2 Bathrooms, For up to 6 persons + infants. 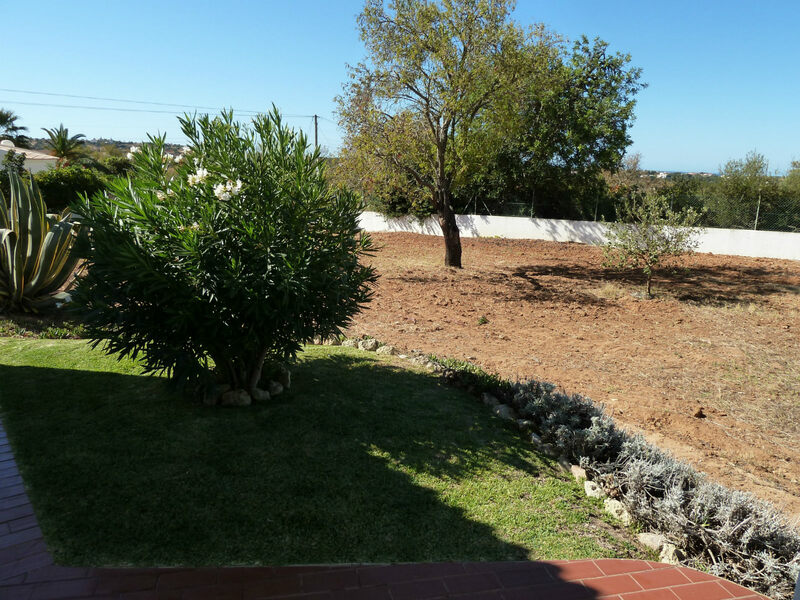 Villa Julia, is an extremely good quality, very popular villa, with 3 bedrooms, 2 bathrooms with a very private pool, situated in a superb, beautiful, quite, green location near Vale de Ursa, Tavagueira, Guia, Albufeira. 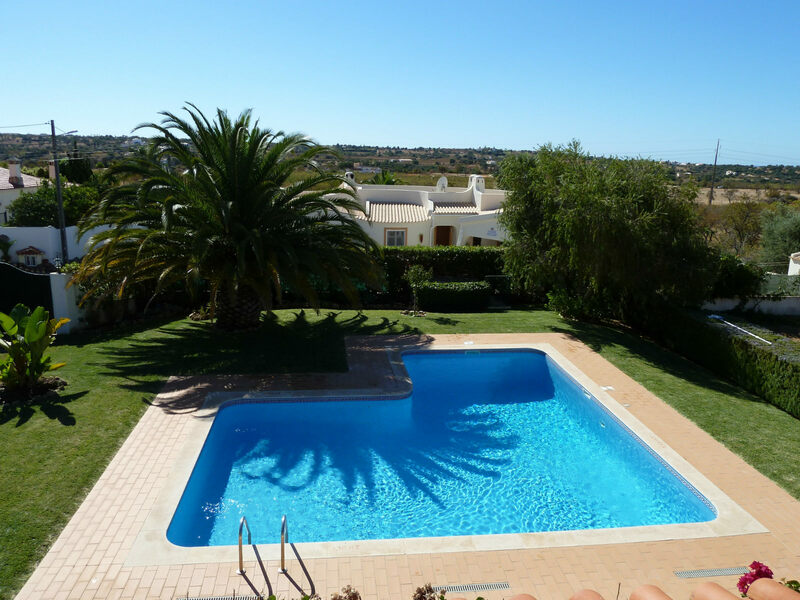 Facilities available: Villa Julia, is an extremely good quality 3 bedroom, 2 bathroom villa with pool, situated in a beautiful green area of Tavagueira, Albufeira. One of the most delightful spots on the Algarve. 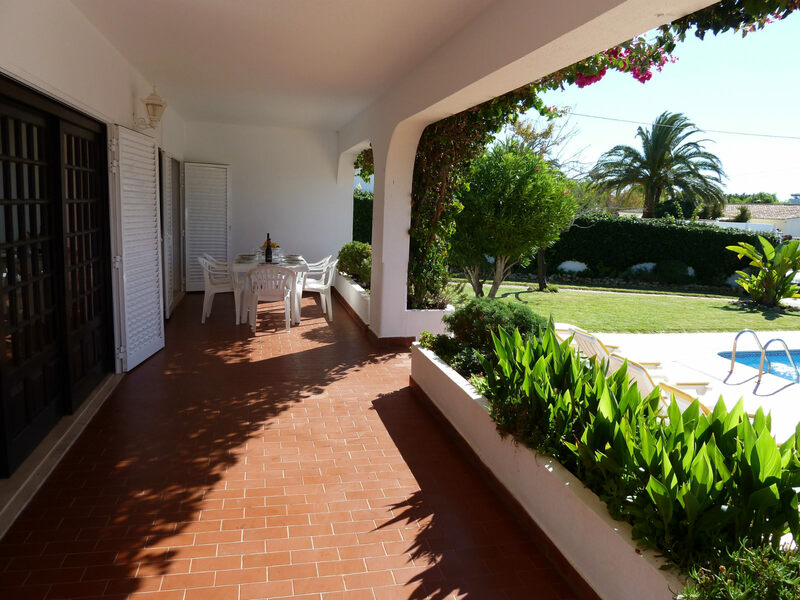 Villa Julia offers, privacy, well maintained, gardens, lawns & shrubs, parking, gate, creating a relaxed & comfortable atmosphere, complete with superb countryside & partial sea views. Yet, the villa is close to everything. Walking distance to ‘O Chalet’ Restaurant/Cafe 800 metres away, offering daily dishes & a la carte menu. Then, there’s Guia only 2.5 km, with many restaurants, banks, supermarkets, daily market, etc…Guia, is also home of, Zoomarine, Algarve shopping, open daily until midnight, home of Zara, Mango, Continente. As for Albufeira Old Town, with many restaurants, bars, cafes, shops, gift shops, including the fabulous Fishermans Beach! All, under 5.3 km away! And, come night time, Albufeira, comes alive with its many lively bars & clubs. Super villa, super value! 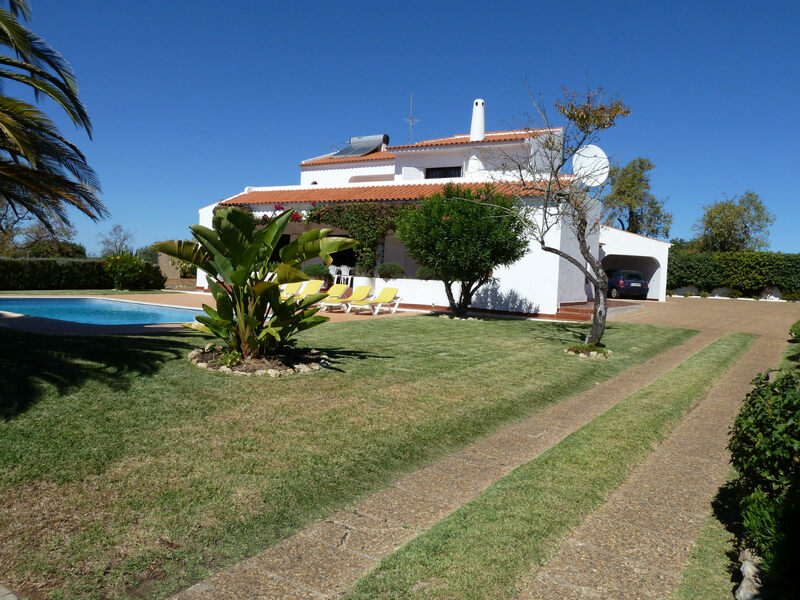 Superb location & surroundings: Villa Julia, is an extremely good quality 3 bedroom, 2 bathroom villa with pool, situated in a beautiful green area of Tavagueira, Albufeira. One of the most delightful spots on the Algarve. Villa Julia offers, privacy, well maintained, gardens, lawns & shrubs, parking, gate, creating a relaxed & comfortable atmosphere, complete with superb countryside & partial sea views. Yet, the villa is close to everything. Walking distance to ‘O Chalet’ Restaurant/Cafe 800 metres away, offering daily dishes & a la carte menu. Then, there’s Guia only 2.5 km, with many restaurants, banks, supermarkets, daily market etc…Guia, is also home of, Zoomarine, Algarve shopping, open daily until midnight, home of Zara, Mango, Continente. As for Albufeira Old Town, with many restaurants, bars, cafes, shops, gift shops, including the fabulous Fishermans Beach! All, under 5.3 km away! And, come night time, Albufeira, comes alive with its many lively bars & clubs. Super villa, super value! 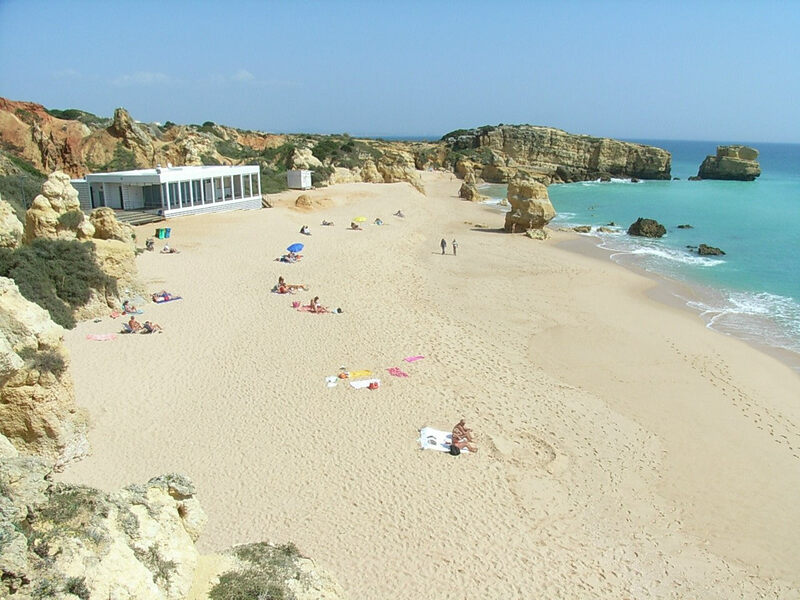 Best Beaches, Sunny, Quality Resort in Europe: Picture postcard beaches can be found throughout the Algarve, non so, than around the beautiful region of Albufeira. The best equipped beach from the villa, is Fishermans beach 5.3 km away, you’ve got to see it to believe it, an absolutely gorgeous beach, with many bars, shops & restaurants, water sports, etc.and, at night it comes alive with many lively bars & clubs. 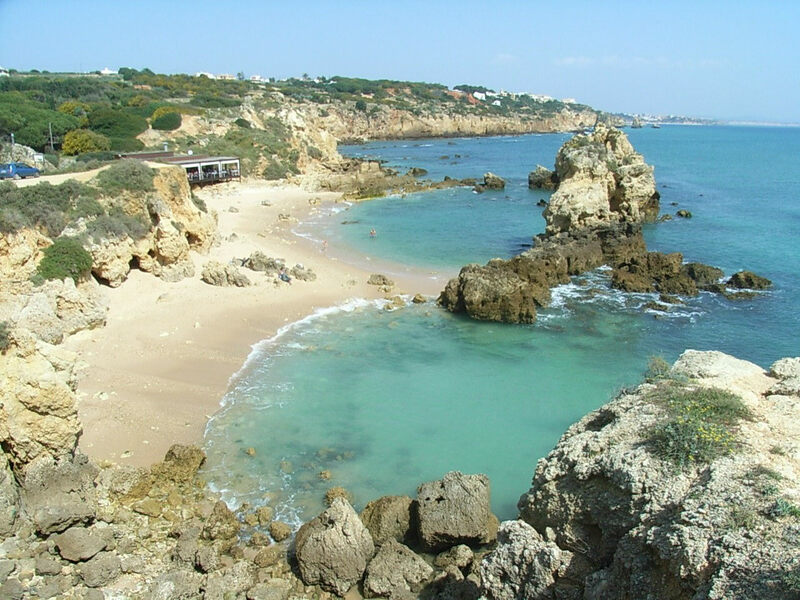 There are many beaches nearby; Colorful Praia da Oura beach, Olhos de Agua is a must.! 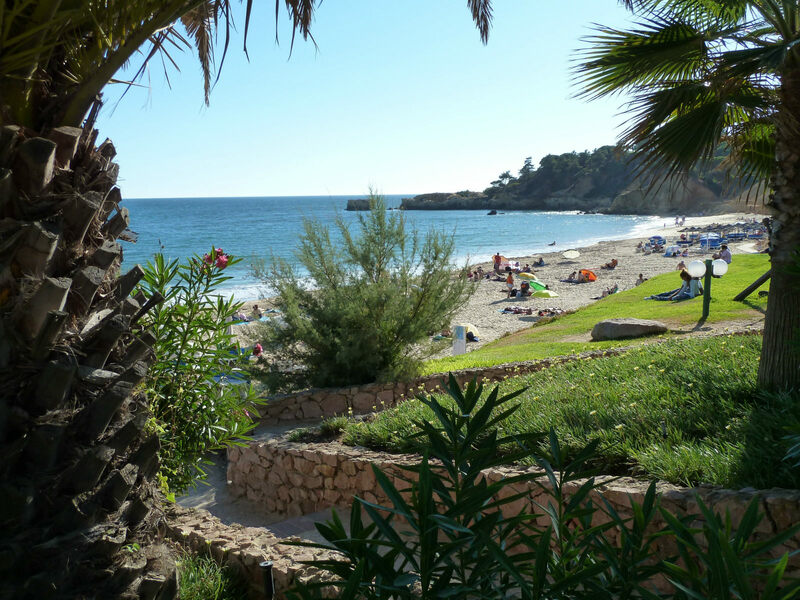 Sao Rafael beach, Arrifes (our little favourite) & more…all small pretty beaches. Inland Algarve is well worth exploring, including the local villages, mountains of Monchique, also visit, the oldest town on the Algarve, Tavira! known as The Venice of the Algarve. Also, visit the pretty, neighbouring Cabanas for lunch or dinner, at one of the many restaurants overlooking Ria Formosa nature reserve. Everywhere you go you will find a warm welcome from the local, very friendly people, of this fascinating & sunny region-The Algarve. 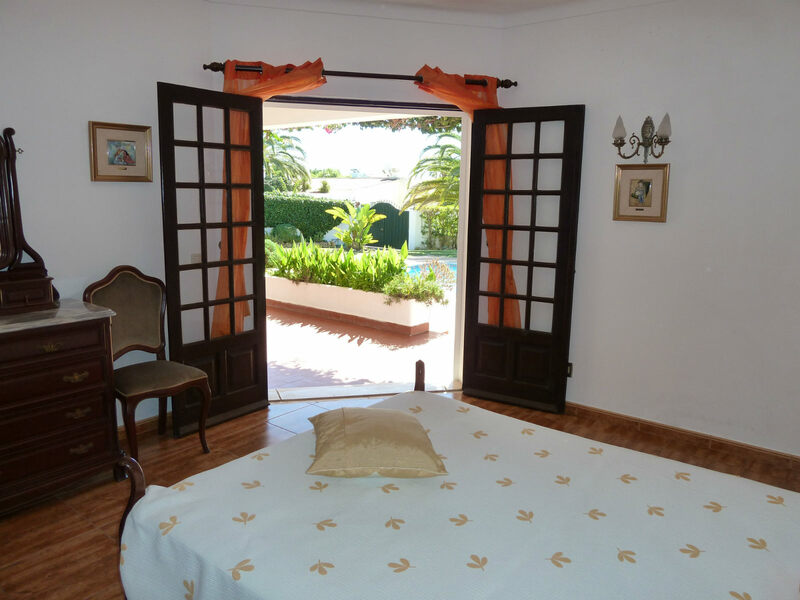 A delightful spot on the Algarve, which many repeat clients return, year, after year. Offering, privacy, well maintained gardens, lawns & shrubs, private parking, entrance gate, creating a relaxed & comfortable atmosphere, complete with superb countryside & partial sea views. The villa is close to everything, easy driving distances, or walking distance to ‘Sao Martinho’ Restaurant/Cafe 600 metres away from main road, offering one of the best daily dishes around, at a great price too! & a la carte menu (closed sunday). Then, there is Guia only 2.5 km away, with many restaurants, banks, supermarkets, daily market, etc. Guia, is also home of the famous piri, piri chicken, Zoomarine and the fabulous Algarve shopping, which is open until midnight, with many shops, including, Zara, Mango, and many others, including many restaurants, Continente supermarket, etc. As, for Albufeira Old Town, with it’s many restaurants, bars, cafes, shops, gift shops, including the fabulous Fishermans Beach is only under 5.3 kms away! Come night time, Albufeira old town, comes alive with many lively bars, clubs, restaurants with live music, etc…. Super Villa! Amazing Value! Faro airport is only half an hour drive away (33 km). Balaia Golf Village, 9 Holes, Par 27, Couse distance 984m / 1177 yd. Located near villa in Balaia, Albufeira, Algarve. Pine Cliffs Golf, 9 Holes, Par 33, Course distance 2227m. Located near villa in Falesia, Albufeira, Algarve. Salgados Golf, 18 Holes, Par 72, Couse distance 6080m. Located near villa in Albufeira, Algarve. The near by resort of Vilamoura offers six, 18 hole golf courses, including the Par 72, 6560m Victoria Golf Club; Vale do Lobo and Quinta do Lago with six, 18 hole golf courses, including the aclaimed Par 72, 6238m San Lourenzo Golf Course. 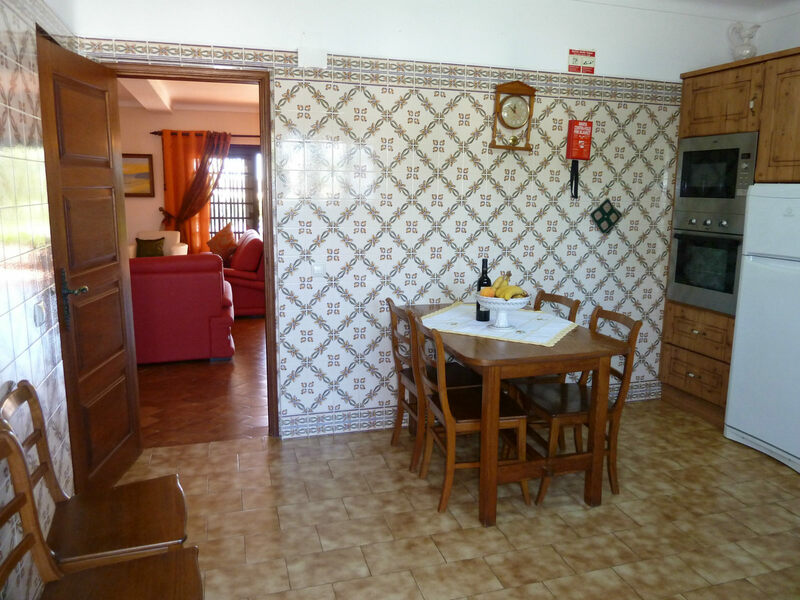 They are all easily accessible, within short distances by car, by motorway which is only 5 minutes drive from the villa. Seven golf courses can be found further West on the Algarve, and a further four golf courses on the Eastern Algarve, again with easy access via the motorway. Restaurant: ‘Sao Martinho’ Restaurant – 600m from main road. 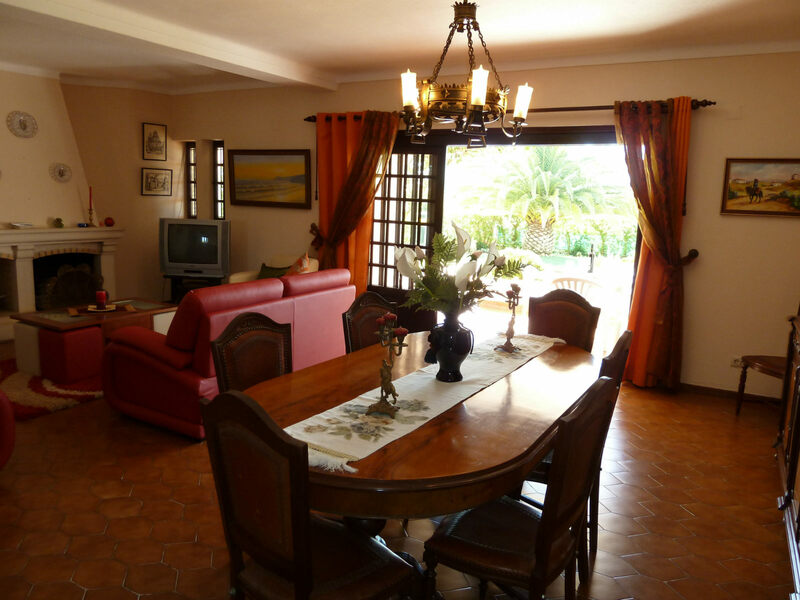 This beautiful villa, occupies the ground floor, with 3 comfortable, well appointed bedrooms! 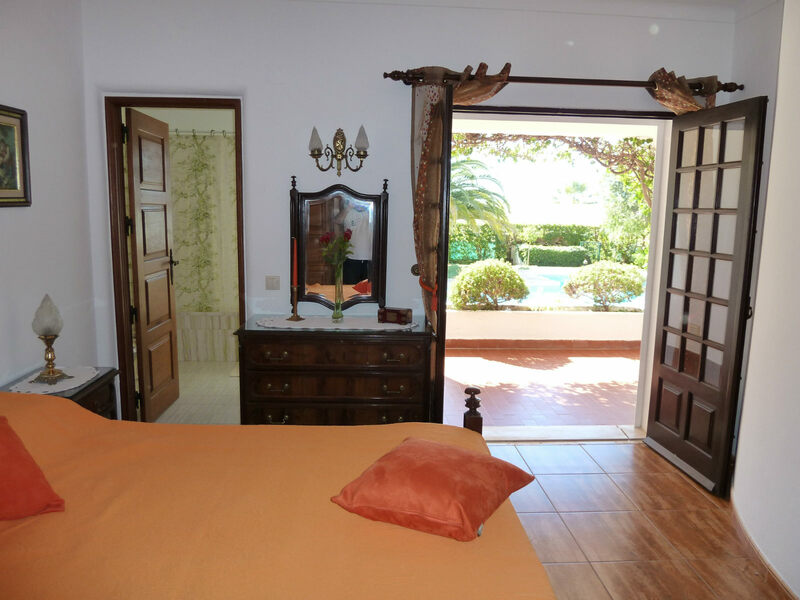 Comfortable, colourful bedrooms, with shutters, complete with traditional furniture, bedside cabinet/s, tilled flooring, rugs, and each of the bedrooms have built in wardrobes, chest of draws, mirror, with double doors, all, with access to terrace, pool and gardens. Private en-suite bathroom, in master double bedroom, colourful, attractive, bright, light green bathroom, tilled flooring, window, combined bath/shower, bidet, WC and basin. Shared bathroom: Colourful, attractive, bright bathroom, tilled flooring, window, combined bath/shower, bidet, WC and basin. * Once weekly main clean, with a midweek light clean and change of bathroom & pool towels. * 1st floor of this villa is not used. * Cots and high chairs available at extra cost. * Extra bed not available. * Check-in from 16.00 hr; Check-out 10.00 hr. (Villa Julia) *land & partial distant sea views *3 bedrooms, 2 bathrooms * very private villa *spacious villa *beautiful! well established gardens & lawns *orchard with almond and fig trees (help yourself) * superb land and distant partial sea views *beautiful terrace with superb views *two full bathrooms * all rooms with terrace *BBQ *large L shaped pool 8 x 8 meters *maid service *satellite TV *DVD player *coffee machine *toaster *kettle * washing machine *fully fitted modern kitchen *dishwasher *driveway for several cars & covered parking *safe *hair dryer *iron & ironing board *sunny, south facing terraces *steps to pool, depths (1.10, 1.40 metres to 2.10 meters deep) *gated villa *car hire recommended. Nearby:- ‘ Sao Martinho ‘ Restaurant / cafe, 600 metres from the main road, serving daily dishes of the day, a la carte menu, cafe & snacks served during the day & night, closed Monday * nearby bus stop *2.5 kms to Guia town *5 kms to Guia Algave shopping. My 3 children and I had an amazing stay at Villa Julia. The Garden and pool area I would rate 10 out of 10, stunning and well kept. The House itself is well maintained it’s well worth picking this villa over anywhere in town as you’d never get this kind of property or peace and quiet anywhere closer.. Carlos was on call with any questions or problems so couldn’t rate him high enough, we had a great holiday eating out and partying in the night followed by relaxing in this beautiful villa in the day or at the beaches near by. Hugo was on hand at a simple txt to take us anywhere we wanted to go and pick us back all for £15 Euro’s at a time. If I had the chance id go back tomorrow I would. Can’t wait to stay there again in April 2019. Just booked for the 4th time! Villa is just lovely, it’s everything you need and more. Beautiful pool and gardens. New BBQ is amazing. Never been to any villa twice let alone 4 times. Home away from home. Julia is in a very pleasant location not part of a complex which means it private and quiet ,perfect for those that wish to avoid the hustle and bustle of holiday life. We (4 of us)had a great week and will be returning again this year . 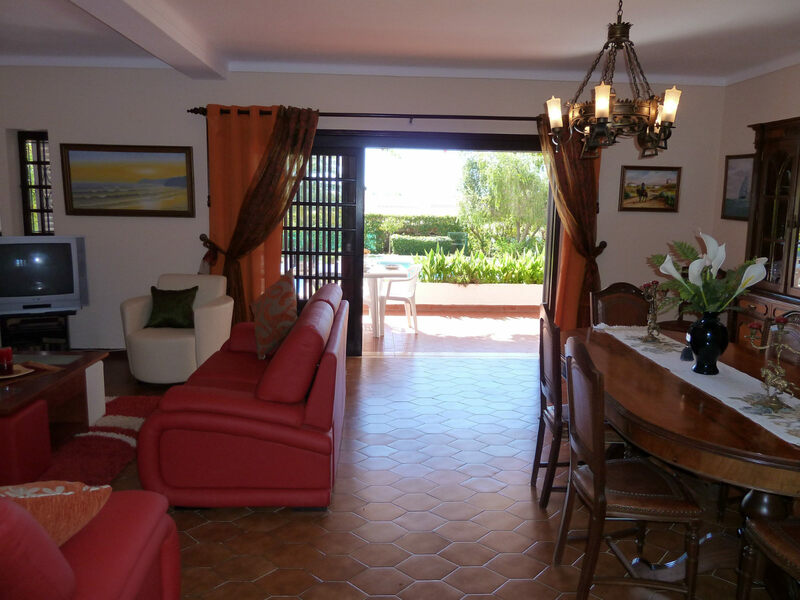 The villa is nicely furnished ,its clean, airey and has an added benefit of a garden at the side which has various fruit trees including lovely figs. Of all the villas we have stayed in over our many years Julia tops the lot. My Family of Four had a wonderful Week in Julia last September ,we found the Villa everything as advertised and are returning this Year. We would highly recommend not only Villa Julia but also Villa Borboleta in which stayed in 2017. As we had stayed at Villa Julia the previous year we knew what to expect and were not disappointed. As the previous year we spent all our time either sunbathing, swimming, or sitting in the shade under the lovely patio area. This is a wonderful villa to get away from it all and relax. Never before have to gone back to a villa twice, however, we have booked again for next year – so I don’t know what better recommendation we can give. The property exceeded my expectations from the extensive grounds, well stocked kitchen to the comfortable beds. The star attraction though must be the pool. The maid service part way through the week to change towels was an unexpected bonus and the pool staff were on hand to keep on top of things during the week. The real highlight of the property is its seclusion, ideal for a private family holiday and with the benefit of a 5 – 7 minute drive to Albufeira Old Town and the same to the Marina. A wonderful week spent here and a property which I intend returning to again and again. Booked a quick week away for last minute sun. It turned out to be so much more. The villa was perfect, perfect get away location, yet easy to get everywhere, perfect pool and land area. 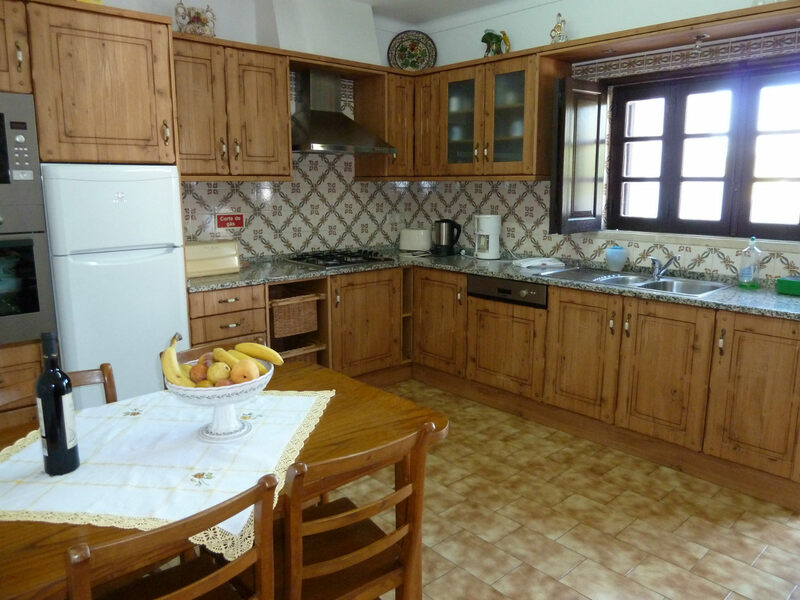 Although the villa itself is a little dated or you could just say rustic, it was wonderfully clean and the kitchen was very well equipped. As the patio and pool area was so well serviced we only used the actual villa for cooking and sleeping. Our recommendation is that we have done something we have never done before – we have rebooked for the same time next year – can’t get a better recommendation than that. Many thanks Carlos for making everything so easy. Villa Julia was a great base for our holiday. Carlos is lovely and very easy to deal with but you might have to forgive his tendency to CAPS lock in his mails. The villa itself is a little dated with a CRT TV, some older furnishings, etc but to be honest when you are on holiday the last think you should want to do is watch TV and while some fixtures were old, everything was clean and worked perfectly. The pool caretaker and cleaner both did a great job while being almost invisible. The pool is perfect for a family. There is plenty of room for kids while the deeper section is nice too. The garden is full of flowers and the fruit trees are a nice addition too. This was not our fist trip to the area and we tend to visit quite a few attractions so I knew this villa would suit us with or car rental. 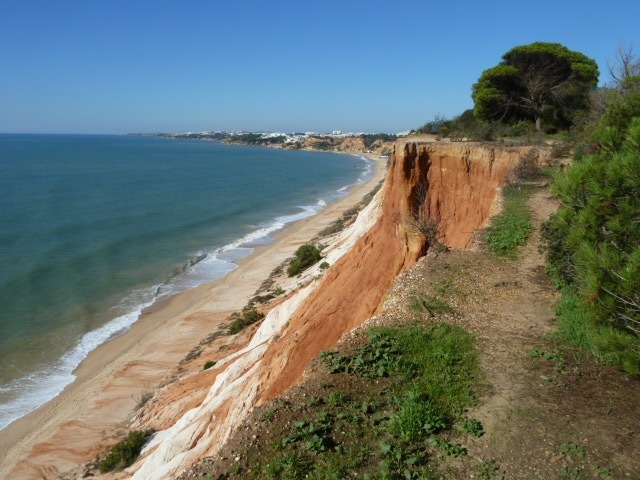 The old town area of Albufeira, the marina and several lovely beaches are easy to drive to, as are the FEISA sand sculpture competition, Zoomarine and the Algarve shopping mall. Most places are less than 10 minutes away and very easy to find even without a sat nav and the Portuguese people are genuine and friendly if you ever need their help. Would I recommend it to a friend.. in a heartbeat. I was very impressed by the photos of this villa which drew me in to start off with. once you get there it is so much better than the pictures. the rooms are a lot bigger than expected. it is about a 15 minute drive to the shopping centre and 15 minute drive in the opposite direction for the old town and albufeira strip. We couldn’t thank Carlos enough. The TV broke on our 2nd Day but we sent Carlos a message to advise him of the issue and low and behold we had a new one that evening. I Highly Recommend this villa and i can’t wait to go back. Samen met 5 vriendinnen een geweldige vakantie gehad in Villa Julia. Het huis is groot en schoon en de tuin is meer dan geweldig. De villa heeft enorm veel privacy wat wel met zich mee brengt dat om naar de stad te gaan een taxi/auto nodig is maar door de hulp van taxi Hugo die ons werd aangeraden was dit geen probleem. Villa Julia is zeker een aanrader! The girlfriend and I had a fantastic stay at Villa Julia. The Garden and pool area I would rate 9 out of 10, stunning! House itself is well maintained and very spacious, although remote it’s only a 15 euro taxi from Hugo into town (bit more expensive than a taxi but a taxi would never find it) and 10 euro back by taxi so it’s well worth picking this villa over anywhere in town as you’d never get this kind of property or peace and quiet anywhere closer.. Carlos was on call with any questions or problems so couldn’t rate him high enough, we had a great holiday eating out and partying in the night followed by relaxing in this beautiful villa in the day. If I had the chance id go back tomorrow! Can’t wait to stay there/in one of Carlos’s villas again! Regards, Vincent. Wij zijn met familie 11 dagen in deze villa geweest. Echt enorm genoten. Het huis is groot, heeft 3 slaapkamers, grote woonkamer, keuken en 2 badkamers. Het werd tijdens ons verblijf goed bijgehouden, alles was netjes en schoon. Het is echt een heerlijk huis om te verblijven. Het ligt wel zeker 10-15 min rijden van Albufeira, zonder huurauto is het niet aan te bevelen. Rustige omgeving, Algarve is prachtig om met auto te verkennen. Al met al echt een aanrader dit huis. BEAUTIFUL VILLA WITH A BIG, CLEAN POOL A NICE GARDEN. IT`S ALSO A VERY QUIET NEIGHBOURHOOD, AND LOVELY TO SIT AND RELAX. WE WERE HERE WITH OUR CHILD OF 17 MONTH,S AND EVERYTHING WAS HERE WHAT ASKED FOR (COT AND HIGH CHAIR). ALBUFEIRA IS A NICE TOWN WITH GOOD RESTAURANTS AND NICE SHOPS. WE COULD RECOMMEND RESTAUTANT ” A RUINA” BESIDES ALBUFEIRA FISHERMAN’S BEACH WHERE YOU HAVE A BEAUTIFUL VIEW TO THE BEACH AND THE SEA. HOPEFULLY WE CAN COME BACK IN THE NEXT COUPLE OF YEARS. 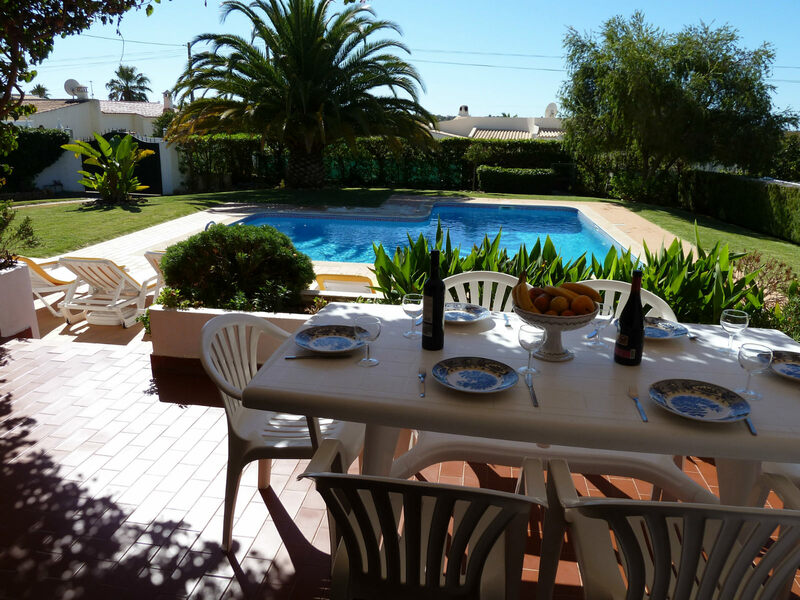 WE WISH ENJOY A VERY NICE STAY IN VILLA JULIA AND ALBUFEIRA.